It’s that time of year again when colds and the flu spread like wildfire. Between school and work, most college students don’t have time to be sick, so preventing illness is a big priority. “I was sick right before classes started for the quarter so I had to miss the first day of class and should have been out from it the whole week but I couldn’t,” said Rachael Figg, a business major and women’s soccer player. “Because I wasn’t willing to miss, I had to go to class tired and still very sick, so it was definitely hard to focus on anything else,” continued Figg. The symptoms of the cold and flu include a dry, hacking cough, moderate-to-high fever (although not everyone with the flu will run a fever), sore throat, shaking chills, severe muscle or body aches and headache. “I had a fever and felt like my head was going to explode,” said Figg. As a student-athlete on the women’s soccer team, Figg’s sickness affected not only her academics but her duties as an athlete as well. “I had to be excused from soccer practice because I couldn’t breathe all too well,” explained Figg. “My breathing patterns were off and it was very easy for me to lose my breath,” added Figg. Like Figg, many college students have faced an illness that has caused their academic performance to suffer. “It will reduce productivity. If someone is sick, they can’t get their classes done, their exam, they can’t study, they can’t go to work, etc.,” said Juan Barajas, a pharmacist at the CVS Pharmacy located near campus. During flu season, college students are desperate to protect themselves against any type of sickness so that they may be healthy and stay on track with their studies. “I’m not too sure what caused the sickness because I don’t get sick often at all,” said Figg. “If I could pinpoint anything, though, I would say not getting the proper amount of sleep and sharing drinks with friends who may have been sick, and on top of that not drinking enough water,” added Figg. It is important to understand the different ways to take care of yourself. To avoid the flu, “Two things – get the flu shot, one, and second, practice good hygiene, washing hands, covering mouth when coughing, that kind of thing, those are the biggest things you can do, ”said Barajas. “There is one medication for the flu, it’s called Tamiflu, which will help reduce the duration of the flu if taken early,” added Barajas. Tamiflu is available in liquid and capsule form. It is best to take it when you have had flu symptoms for at least two days. To recover from the flu quicker, “taking care of your body, resting, treating the symptoms with over the counter medication, good diet, those are the best things you can do,” said Barajas. 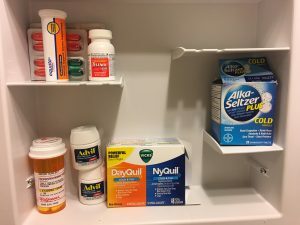 As students look to defend themselves against illness, they should know that cold and flu care is available in the Student Health Center on campus. The health center include flu shots for students. The main goal of the health center is to promote good health for college students who are on the road to professional success.